Cora Cool-Mihalyi, a graduating senior in the School of Education and a Say Yes Scholar, firmly believes in and exemplifies the principle that all children deserve the right to equal education, regardless of their background or disabilities. 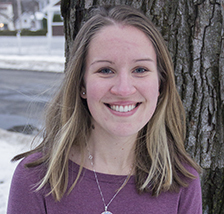 Cool-Mihalyi is completing her coursework in the inclusive elementary and special education program, and shares her experiences working in the Syracuse school system during her time at the university. First, tell me more about your program. What do you do on a day-to-day basis? What is the coursework like? It’s a dual degree major, and it’s really rigorous; more so than other programs. There are three primary professional blocks of classes, each focusing on a different area of study. Also, each block is paired with a five- to six-week placement in a local school. I loved the opportunity to work in those environments, because I myself went to Syracuse City Schools; I’m from here, and I graduated from there. So, how do you learn to be a teacher? How do they teach you how to teach? During the professional blocks, they front-load our semesters. We look at the content we’re going to be teaching students, and examine the best ways to teach it. So we do all that learning in the first half, and then teach in the second half. I get graded on my lessons that I teach to my students based on the accuracy of the content, the methods that I choose to use to teach it and my ability to teach to all learners. Also, because of my major, most of my placements have been in inclusive classrooms, meaning that there are always special needs children in my classes. I believe that everybody deserves to be taught together, not separated, and although I change the delivery of my content based on the specific audience, I never change the actual content itself. One of the things I do is differentiate instruction, meaning that when I give my instructions, I give them as both words and pictures, so that everyone ends up doing the same thing, even if they need to initially process the information in slightly different ways. Now that you’re a senior, what’s the next step? I have to get my master’s degree within five years of graduation. It’s just a requirement to continue teaching. But next fall I’ve been accepted to student teach in New York City, which is an amazing opportunity. I’ll be somewhere in Brooklyn, although I don’t know exactly where yet. I’m very excited to start, and to get even more experience teaching in a different area. After I complete my student teaching, I plan on teaching for a year or so before beginning my master’s. Before diving too far into my master’s, I want to be absolutely certain that this is the path I want to take. Outside of your major, you’ve also been very active in the community. What are some of the things you’ve worked on? I’m very much about urban education. Like I said, I’m from Syracuse, and these schools are often portrayed as rough, but I had a wonderful experience and I’m proud to be a Syracuse City School District) graduate. So, I’ve done a lot of activist work for this district, and for the Say Yes Scholar program, which is a program that pays for students to go to college, provided they’ve already been accepted into that college on their own and gone to a city high school for three years. Where you come from shouldn’t affect your placement or your opportunity; no student matters more than another, and that’s an ideal that I’ve stood by throughout all my time here.